When A Perfect Circle‘s Mer de Noms released, I was at one of the lowest points in my life. It was a time when nu-metal and boy bands invaded the airwaves, and when I heard the first APC song on the radio, I remember thinking, this is what music is supposed to be. It really spoke to me at a time when I needed to hear that I wasn’t the only person in the world that felt lonely, isolated, dissatisfied, and hollow. I never got to see APC back in ‘the day’, and I’ve always dreamed of it. However, when these shows were announced, my mother was in her last weeks, and when the tickets went on sale, I was reading the eulogy I wrote for her at her funeral. Luckily, my friends knew what this band means to me, and I ended up with tickets to all three LA shows and something to look forward to after my darkest days. I decided to indulge this trip….room at the Sunset Marquis, rented a Dodge Challenger….I felt that something spiritually significant would occur to me on this trip, with these shows…or at least I would will it to be. The best friend decided to join, and when we pulled up at the Marquis, the valet remarked, “It’s rare I see two girls in a Challenger!”. 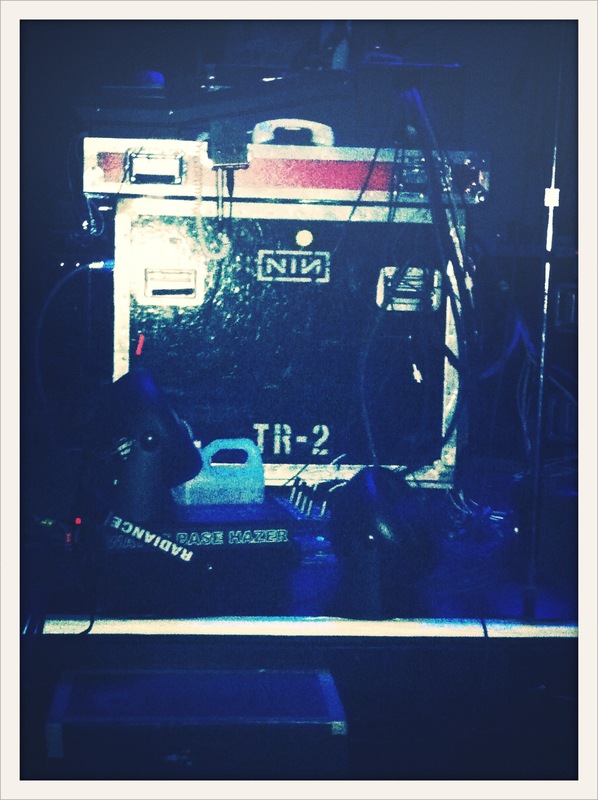 I went to the Avalon about an hour and a half before the show began. The line was already sprawling down the block. It was cold and windy outside- miserable line weather- but I was in such a good mood that I didn’t care. This night was finally happening. Once inside and placed in a secret pocket on the left side of the stage, I started to feel the anticipation of the crowd. A band that hadn’t toured in 6 years, sold out shows, waiting in line…this ended up translating into a crowd so entranced that once the band hit the stage, the mellowness served as a bizarre contrast to the music. The pre-show music was ABBA, which amused the crowd as the venue filled up. 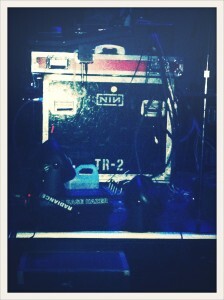 We spied an equipment box decorated with the NIN logo and reminisced. The band came on promptly at 8:30, and the crowd roared and then settled into the album. The set up, two tiers; the lower holding bassist Matt McJunkins, the only non-original member, and guitarist Billy Howerdel. The second tier held Maynard, guitarist James Iha, and the illustrious Josh Freese. My first reaction was to laugh at Maynard’s hair; bizarre braids decorated his head. And then as Freese started on drums, I remembered how much I love watching him play, and was filled with NINories of following around the Lights in the Sky tour. As I’ve said before, there’s a different way you experience a set when you know what song is coming next. As those first notes of ‘The Hollow’ filled the room, I watched Maynard sing. He’s so effortless, grasping a bottle in one hand and the mic stand in the other. It just looks like he’s talking as the lyrics sail from his throat. I went to another place during this set. The way the band is set up, each performer in his own little station, make it somewhat unnecessary to watch their every move. I found myself closing my eyes, being consumed by the sound, moving along to every beat. Where is the place that I go? It doesn’t exist in reality, and words don’t give it justice. It’s a place where I hold my pain in my hands and stare it in the face. It’s where I’m held by someone who cares about me and tells me everything’s going to be ok. It’s red, then blue, then purple, then a color no one has a name for. It feels like silk and then sandpaper. It’s hot and then cold, solid and then fluid. It’s a falling sensation followed by butterflies. It’s the unknown paired with certainty that something really amazing is coming. It’s the knowledge that no matter what happens, I can listen to this album and go to this place, a place that is mine, that I’ve created, and that no one else can damage. There’s something really special about APC, and this album in particular. Perhaps it is the alchemy of other work of the players: the heaviness of Tool, the sentimental vibe of Ashes Divide, the melancholy of Smashing Pumpkins, the…uh….precision Freese brings to the 10 bands he’s in at any point in time. There were two things that brought me back to reality during this set. One was having to listen to and move for security busting people with cameras. Love Maynard to pieces, but the way his camera policy is handled is distracting. There has to be a better way. At the beginning of the show, he kept pointing people out. One girl was dragged out of the pit three times. The other thing that happened sounds like a Saturday Night Live skit. A girl in the VIP box was wearing a beret and a romper. At one point she drunkenly climbed out of the box and down a pole to the floor. She was soon spotted back up in the box eating a banana dancing to the music. WTF? So random. “Show me the way to forgive you…Allow me to let it go…Allow me to be forgiven…And show me the way to let go“. The lyrics to ‘Thomas’ really hit home this evening. Except I’d change ‘forgive’ to ‘forget’. Maynard talked about this being a test run of shows- a ‘getting reacquainted’ period. He would go around and have each member say how many times they fucked up. Iha told a series of reallly bad jokes during one of the setup transitions. I mean REALLY BAD….but his dry delivery of them was priceless. During one of the songs, Maynard threw a bottle of water and Freese caught it in the middle of a song. The show wrapped up with two encore songs. For the first one, Troy Van Leeuwen from QOTSA/Sweethead/UNKLE came out and replaced Iha on guitar for their cover of Bowie’s ‘Ashes to Ashes’. The final song was their cover of ‘Imagine’, which I love. There’s something about leaving a show knowing you have two more to experience. I felt emotionally wrung out, and ready to come back for more. When I heard they were playing each album on different nights I was quite troubled in deciding which one of the first two I wanted to go to. (This was before I found out about the 3 days pass) There is something definitely amazing about Mer de Noms. I wish I could have gone to all 3 but ticketbastard screwed me over and I could only afford to buy scalped tix for 13th Step. My consolation prize for Monday was seeing SSSC at the Roxy this night instead. I got to meet Danny Carey while waiting for SSSC so I guess that and reading your blog make it easier for me to know I missed one hell of a show. awesome!! i thought about running over to that SSSC show after…. That would have been awesome, two great shows at 2 different Hollywood venues. With the APC show ending so early it would have been possible.